Our Book! People Talk About it! 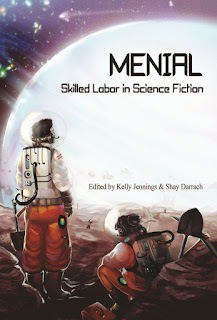 You might remember my mentioning Menial: Skilled Labor in SF, the anthology I have been working on with Shay Darrach, due out in January. A mention and the ToC at SF Signal. A link to SF Signal off Tor.com. And, over here at i09 (one of my favorite sites, so I'm very pleased), a very nice post. My interest is officially piqued -- the Mars Science Laboratory team has found something on Mars. Not yet, anyway. Speculation abounds, but most people are guessing some sign of life (past, probably) or water. I'm hoping for something cooler -- instructions on how to build a jump drive, maybe, left there by a wandering merchant ship two hundred thousand years ago. Or keys to a hangar full of working space ships? But yeah, okay. A nice aquifer (past or present) would also be cool. We had eleven people sit down for dinner today. This was lovely. Though tricky, since we only possess nine chairs, and eight knives, and somewhat fewer spoons that that even. Also only nine dinner plates, and five wine glasses. But luckily none of our guests are the sort who get twitchy over minor details like being asked to sit on a shoved-up rocking chair or to balance on the arm of an armchair during dinner, or mind drinking their wine from a jelly jar. Everyone hung out after, talking movies and politics (we are all liberals except my father who voted libertarian, and we all think Lincoln is an amazing movie, those of us who have seen it do anyway) while we drank the rest of the wine and ate too much pie. Two kinds of pie, pumpkin and banana cream, plus a chocolate-pumpkin torte. Now I am drinking ginger ale and rum and watching the cat chase the dog around the living room. She appears to be enjoying this somewhat more than he is. So I just got an email from one of the jobs I've applied for, asking for more material. This means I've made a cut -- the committee has chosen my application and probably about fifteen others out of the pool of all the applications to look at more closely. It's good news, though I am trying not to get too excited. Because, you know, fifteen others. Still, it's a great job, in a good place, and I would love to have it. I'm not opposed to this semester ending -- it's been a rough one, due partly to my hideous schedule, and partly to the fact that someone in this house has been sick (or injured or recovering or about to damage themselves) I think every single day of the semester. We might have had a few healthy days. Though I don't at the moment remember them. Anyway! The university is closed for the next three days (Thanksgiving), and then when we return, only one week of classes before the exams begin. I have graded nearly everything (papers! Papers to read! Always papers!) and so can spend the TNX holiday writing and maybe cleaning the house a bit. We're having 12 people for dinner on Thursday. Dr. Skull will do the cooking, of course. He's already begun, in fact: spent most of today and part of yesterday prepping and seething turkey parts, for the turkey broth which will be the foundation of both the turkey gravy and the butternut squash soup. Also he started the sour for the bread. And the turkey, which he will Green Egg, is thawing away. Oh! I will be cooking something: sweet potato casserole, my specialty. With the little marshmallows on top, of course! I spent this afternoon watching Lincoln at our local theater, and I'll just say wow. Beautifully structured, beautifully acted, wonderful sets -- but its strongest point lies in what it accomplished. I saw Tony Kushner, who wrote the screenplay (he's most famous for Angels in America, but he also wrote Munich) on the Colbert Report show a few days, and one question Colbert asked was how he managed to make the passing of a bit of legislation exciting. Well, he did. I was enthralled, and I wasn't the only one. The theater was filled (a Fort Smith theater!) with with silence (except for frequent laughter, because despite the tension, the movie has some very funny bits). What makes it work, I think, is that Kushner (basing his work on Doris Kearns Goodwin's biography) shows just how smart, and just how crafty, Lincoln actually was. Talk about your eleventh-dimensional thinker: Lincoln was it. And self-taught -- the film gets that too, showing without banging on about it Lincoln's working-class background. His grammar is frequently flawed, and he kneels down (crawls around, in fact) to build his own fires in the White House, dresses (and shaves) not like a gentleman but like a working man. There was applause at two points in the movie in my theater (I won't say which two) and afterwards half the theater stayed in their seats, watching the credits through to the end. The music was great too, I'll add. ...short hours of sleep, I mean. It was a great and greatly satisfying weekend, in that I actually did get everything done -- writing, shopping, editing tasks for Menial -- grading and entering those grades, prepping for the week: I am, in fact, for once, caught up entirely.